Part of the reason we have become kaletarians is because we overwintered half our garden in kale, then put in a spring planting just to make sure. 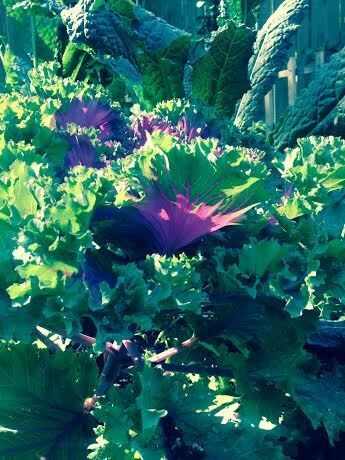 But now we need that garden space for summer crops, so we are redoubling our efforts to consume the kale. This morning, I pulled out the end of the kale (Well, nearly the end . . . I wanted to leave enough for one last magic salad.) and set to work making pesto. Mostly, I used what we had in the house – walnuts mixed with a few pine nuts, garlic, lemons, olive oil, parmesan. 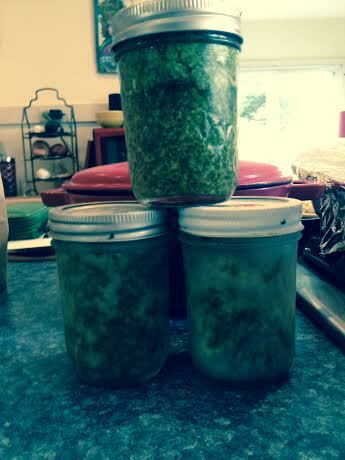 I tossed it all in the food processor and within a few minutes had seven jars of bright green garlicky pesto. There is something tremendously empowering about scrounging through the pantry and transforming that which we babied along in the garden into something decadent and delicious to be eaten another day. Around our house, we have recently discovered that one way to motivate teenagers to think about what they put in their mouths is to ask a simple question: Do you want corporations to decide what you eat? Any amount of nattering on about nutrients or salt and fat content means nothing. But the one thing teenagers loathe above all else is having someone else try to control them. They don’t want their food-pious mother controlling them, for sure. But almost worse than that is thinking that Nestle or Nabisco will decide what they can and can’t eat. Truth be told, I don’t really want General Mills bossing me around either. So I felt downright revolutionary as I pulled huge heads of kale right out the ground and dragged them—dirt and all—into the kitchen sink. I rescued the slugs (I know. Bad idea.) and plunged it all straight into my big enamel pot. It made me feel like Mother Jones or Rosie the Riveter. I don’t think I am some kind of freedom fighter of the kitchen or that I am going to destabilize Nabisco’s business model with my magic kale salad, but if the apocalypse comes, at least I have seven jars of kale pesto tucked away in my freezer. For an hour, I had control over what I am feeding myself and my family. I felt empowered and capable and slightly less passive in the face of the corporate titans. And at very least, I got that kale out of the garden and made way for the subversive song of the summer squash. 2. 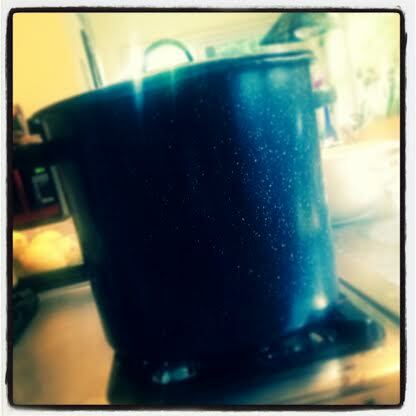 Bring a big pot of water to a boil and blanch the kale for one minute. Drain and rinse with cold water. Dry and press out all the excess water. Dry again. 3. Meanwhile, toast a cookie sheet full of walnuts or pinenuts or whatever you have in the pantry. Cool and rough chop them, too. 4. Toss as many garlic cloves as you can handle, two handfuls of shredded parmesan, the juice of one or two lemons, the kale, and the nuts into your food process. Douse liberally with olive oil, and salt and pepper to taste. 5. Run food processor until the pesto is as coarse or fine as you like it. 6. Scrape into jars and freeze. 7. Wait for the apocalypse.